glacial sediments. Salt can diffuse only through liquid, unlike heat. Thermal diffusivity is also an order of magnitude higher than salt diffusion. The meltwater-filled sediment then loses heat more rapidly than it gains salt, and freezing occurs, welding the sediments to the bottom of the ice. As this mechanism occurs within the subglacial sediment, rapid mixing between continental melt-water and sea water is precluded. The isotopic composition of ice supposedly formed at the grounding line in the region of Terra Nova Bay in East Antarctica provides evidence that such a process really occurs. 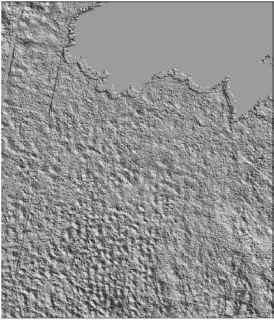 Glacier ice samples in the area considered are aligned in a SD-S18O diagram on a straight line with equation SD = 7.91 S18O + 2.59. The S values of all the samples are more negative than -17%o in S18O and -130%o in SD. By contrast, the debris-rich ice layers thought to have been formed at the grounding line have S18O values between -15% and -3% and SD values between -120% and -30% (black dots in Fig. 35.3b). Such samples are also aligned on a straight line in the diagram with a slope of 7.7 (Fig. 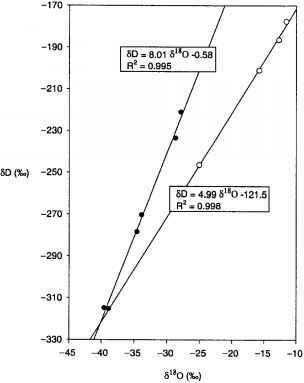 35.3b); with thus an inverse relationship between SD and deuterium excess, as explained above. Such characteristics are the result of a mixture, in various proportions, between meltwa-ter from glacier ice and sea water. 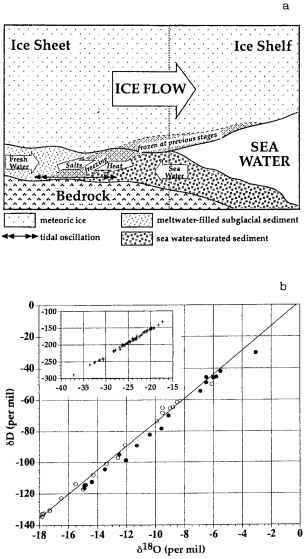 If, as indicated above, glacier-ice meltwater within the subglacial sediment enters into contact with sea water at the grounding line, diffusion does occur. Like salt, heavy isotopes of oxygen and hydrogen diffuse from sea water, when they are less impoverished, to continental meltwater, where they are more depleted. Diffusion coefficients of stable isotopes and of salt in liquid water have the same order of magnitude, so that the double-diffusion mechanism described above also leads to isotopic diffusion. Therefore, the isotopic composition of the debris-rich ice layers formed by freezing depends on the magnitude of the diffusion process prior to freezing. Isotopic composition probably is a better indicator of this diffusion process than salt because the different isotopes are within the ice lattice. They undergo only solid-state diffusion at very long time-scales. From the isotopic composition of the ice layer formed, it is possible to reconstruct the approximate composition of the initial water. Subglacial freezing at or near the grounding line is most probably very slow, so that equilibrium fractionation can be considered. Therefore, taking into account the equilibrium fractionation coefficients for deuterium and oxygen-18 and the respective S values of the ice, it is possible to compute the isotopic composition of the water that was later partially frozen (open circles in Fig. 35.3b). The best fit for these waters is close to points representing S values of sea water in the area and S values of glacier ice and meltwaters derived from it. Deuterium excess is thus in this case totally dependent on the position of a sample on a diffusion line connecting continental meltwater and sea water in the area.